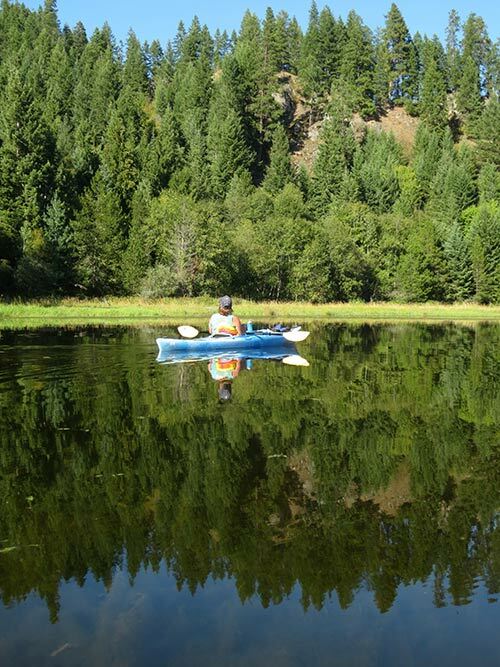 A kayak is my favorite way to experience the big lake and these are three of my favorite paddles a short distance from Sandpoint. 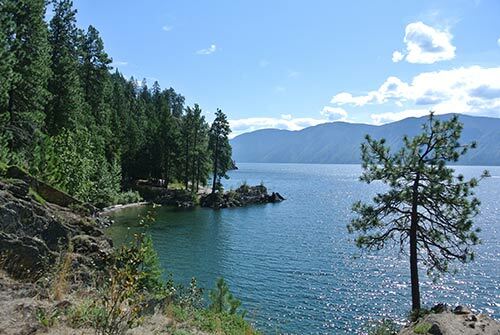 The east side of Pend Oreille near Hope and the Clark Fork Delta. An easy way to experience this rocky shoreline is to paddle around the Sam Owen Peninsula. The Sam Owen Campground is a good place to put in and the bay is quite protected. Hug the shoreline to the south and you’ll find yourself paddling the narrows between our separate pasts. Memaloose Island, on the west, was a sacred Kalispel Indian burial ground. The land to the east on the peninsula proper was the site of David Thompson’s fur trading post, Kullyspell House, the first European establishment in Idaho. Continue southward past intermittent lakefront homes and the cliffs get higher. Take the time to pause at narrow coves and grottos where the moss grows in the recesses and the water is aquamarine. If you’re an angler, small-mouth bass are plentiful on this shoreline and if you’re lucky you may hook a cutthroat trout. The views of the Green Monarchs, the sheer cliffs to the southwest, are magnificent. You may get some wave action out here since you’re on an exposed shoreline so be ready if the weather gets sporty. The take out is a roadside pullout across Denton Slough and directly off Highway 200, just ‘round the horn at the southern tip of the peninsula. Osprey patrol these waters and you may see abundant waterfowl. 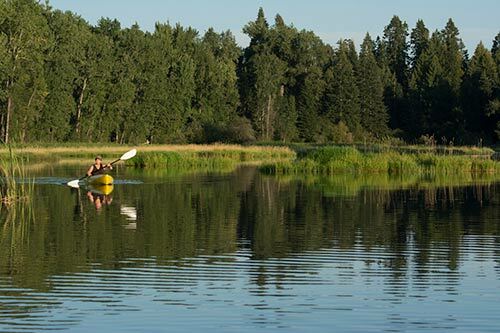 For a quiet, backwater experience and maximum wildlife viewing opportunities, paddle the Pack River Delta. It’s a short drive to the river from town and there’s parking at the bridge on Highway 200. Slip into the water from the reedy banks and put your kayak in stealth mode. Be alert to spotting waterfowl, moose, eagles, osprey, and herons around every bend. The channel bends tortuously through numerous green islands. Several years ago, Idaho Fish and Game implemented a delta restoration project to help stabilize these islands from excessive wave erosion that was worsened by raising the lake level behind Albeni Falls Dam. The extra habitat and cover was also a benefit for water birds. The train tracks stretch across the delta to the south but you can paddle out to the lake under the bridge on the east side. If you’re feeling strong and adventurous, head west on the far side of the bridge to a secluded bay with an island in the middle of it. Thick weeds and shallow water keep most boats out of this backwater so it’s worth the extra paddle. To get a truly unique feel for our inspiring lake put in at the boat launch in Garfield Bay. The large parking lot and open grassy area provide a great start to unload your boats, organize your gear, and get on the water. Garfield Bay is a south-facing amphitheater of deep blue water ringed by dark green forests, that opens up to the expansive south arm of the lake. 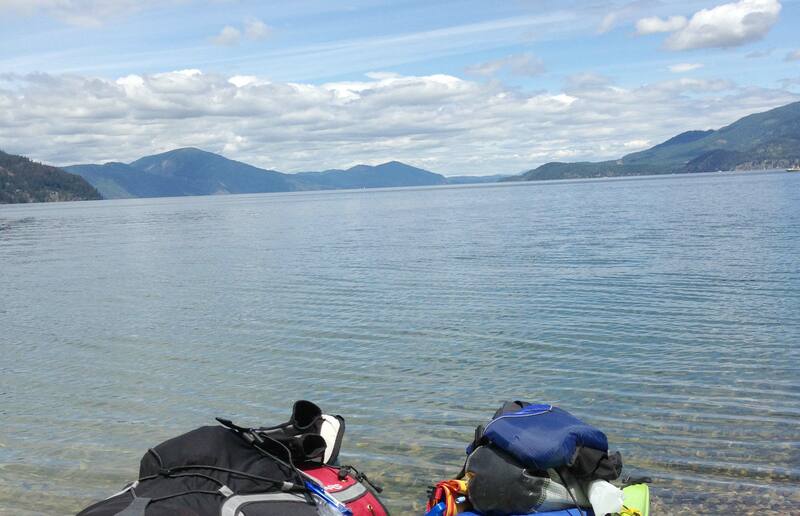 The water is colder in Garfield Bay because it connects directly to the abysmal, 1,200-foot depths of Pend Oreille. As a result, the water is crystal clear and snorkeling along the cliffy shorelines is worth the immersion on a hot summer day. The beauty of paddling out of the head end of Garfield Bay is that either way you go, there are wonderful shorelines to explore and incredible scenery. To the west, the cliffs rise up sheer right out of the water. This section of the lake was forcibly formed by the colossal Missoula floods, thought to have been the largest floods to have ever swept across the earth. Paddling east out of Garfield Bay you round the point into Green Bay, the best rock skipping beach in Idaho. Past Green Bay you’ll discover uninhabited beaches and coves on a relatively remote section of shoreline. As you get more familiar with kayaking your boat will become a trusted friend, always waiting for you, and your favorite places will be destinations that you will want to visit again and again.